July is perhaps my favorite month. I love the summer heat, the cookouts, festivals, fireworks and all of the fresh food from the garden. It's also my birthday month so...what's not to love?! 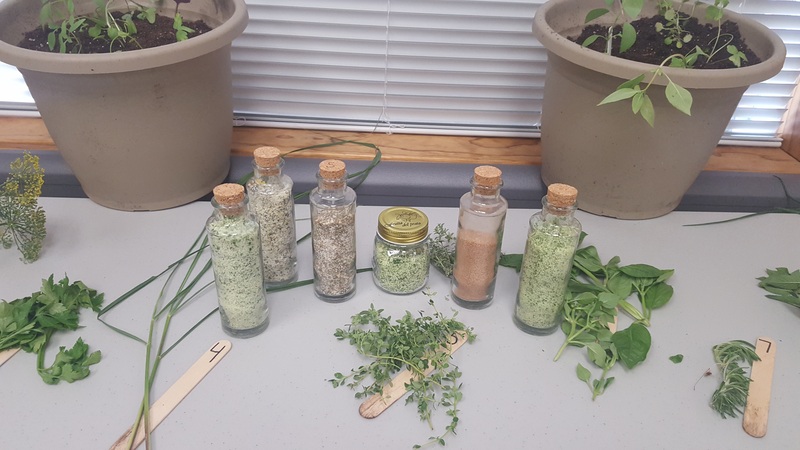 My herbs are in full force right now and it's a great time to maximize their use in the kitchen. I like to experiment with new recipes and other food related projects to get the most out of my herbs. 1. Basil- a summer must-have. I actually have 3 types- Genovese, spicy globe and Thai-all of which are great for pesto. 2. Chives- these take very little work and keep coming back year after year. Their purple flowers are tasty, too. 3. Cilantro- perfect for all of my Mexican inspired creations. 4. French Tarragon- a sophisticated herb with an anise flavor that works well in dips. The French variety is recommended over Russian when cooking. 5. Lemon Grass- new to me this year; it gets huge! The leaves can be dried and used for tea while the stems can be sliced and sautéed into a variety of dishes; often found in Thai food. 6. Mint- I have mojito mint, apple mint and chocolate mint all in separate containers because they will take over. Chocolate mint to garnish my fruit, apple mint and mojito mint taste great in a variety of food and drink recipes. 7. Golden oregano- a delicate herb with golden hues that will add summer splash to pizza and pasta. 8. Thyme- one of my favorites for infused waters. It pairs nicely with pineapple so save your cores to add to a pitcher of water with 6-8 sprigs of thyme. Lemon thyme is also lovely. 9. Dill- this also keeps coming back and can spread to all of your beds if you let it. Pick the dill heads when they are green for the best tasting pickles. The leafy green parts can still be used after flowers appear. Check out this resource for pickles and relishes, I especially like the Lime-Mint Freezer Pickles on page 55. 10. Lemon Verbena- my all-time favorite lemony herb! It makes the best lemonade and tea. I also use it to make lemon cream for fruit dip and to perk up my pesto. Try it, you won't be disappointed! 11. Rosemary- known as "dew of the sea" rosemary is a perfect addition to Mediterranean cooking and can withstand higher heat so it's perfect when roasting vegetables and meats. 12. Parsley- available in several varieties, this broad-leaf herb can add a bright, fresh taste to any dish. Looking for recipes that utilize some of these herbs? Check out this packet of Herbalicious Recipes I use in my programs. Want to use your herbs for a fun foodie project? 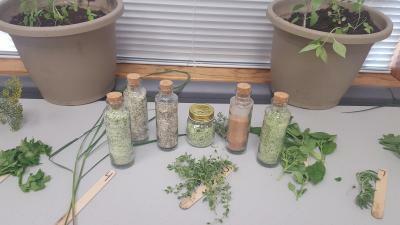 Try these No-Salt Seasoning Blends as well as Herb Infused Salt Blends from my latest herb program. They were a hit! "Top 7 Reasons to Grow & Use Fresh Herbs"
"It's Thyme to Preserve Those Herbs!"